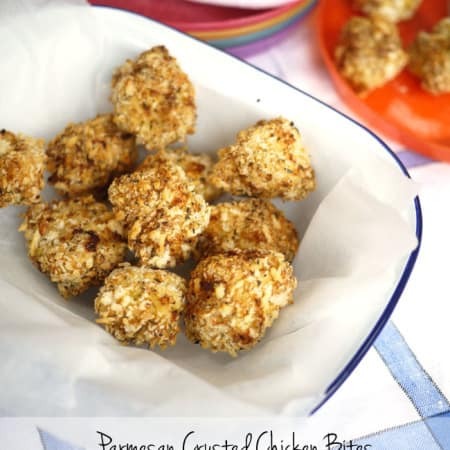 A great family meal with crunchy parmesan crust and soft chicken bites. Cut the chicken breasts into even, bite sized chunks. Put the flour into a plastic freezer bag and add the chicken chunks. Move them around until they are all evenly coated. Put the beaten egg in a small bowl. Put the breadcrumbs, herbs, Parmesan, salt and pepper (leave out the salt for kids if you'd prefer). One by one, dunk each floured chicken chunk in the egg, then the breadcrumb mixture. Remove the 'paddle' from your ActiFry and pop each finished chunk into your ActiFry or onto a baking sheet lined with non stick baking paper. Carry on until all of the 'nuggets' are complete and spread in a single layer (none on top of each other) in your ActiFry or on the baking sheet. Spray with a spray bottle of oil if you have one, don't worry if not, they just won't look quite as golden. Fry in your ActiFry for about 25 minutes or until cooked through. If you're baking in the oven, bake at 180C for about 30 minutes or until cooked through. Gently move the chicken around every 7 or 8 minutes so that it cooks evenly.